Caused by a micoplasma like organism. Plants remain in the vegetative state during the entire growing season. 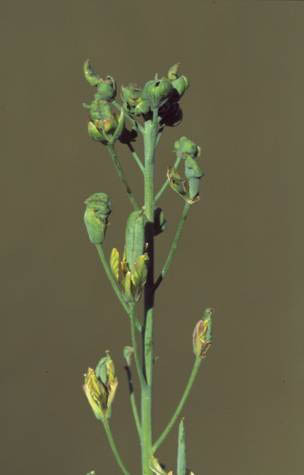 Flower structures remain green and fail to ripen. Spread from plant to plant in the fall by the six-spotted leafhopper. There is no practical means of control, but generally less than 2 percent of plants are infected. (this will redirect you to the fact sheets section of this web site). Survives in infected seed, canola stubble. Serious infection caused by spores released from infested stubble. Introduced into new areas with infected seed. Leaf; light green and circular to irregular in shape. Spots become paper-thin and buff-colored with age and contain numerous pycnidia. Cankers from in spring after flowering and have lost their potential for compensatory growth. Most severe in warm wet conditions during flowering. Soybeans, peanuts, sunflowers are hosts. 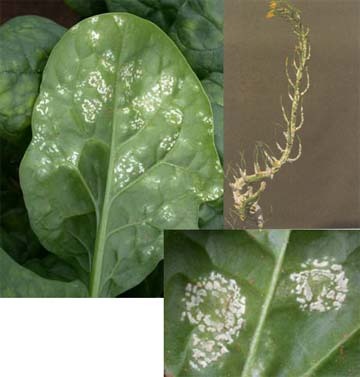 First symptom is prematurely ripened plants. Stems are bleached and tend to shred. 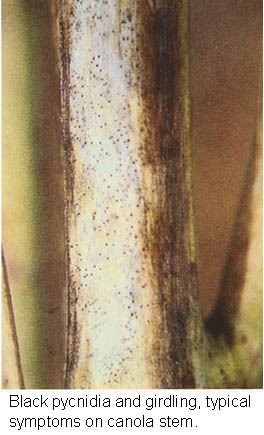 Hard black structures known as sclerotia appear inside the stems near the soil line. 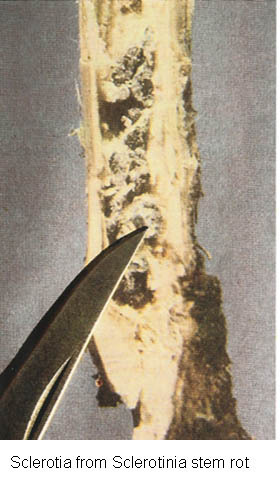 Symptoms of stem rot appear about 10 to 14 days after infection. White dusty growth on aboveground plant parts. Yields are affected when pods are split or early infection kills plants. Black, brown, or gray spots on leaves, stems and pods. Over winters in infested residue and seed. Control achieved by sowing clean, disease-free seed or crop rotation. 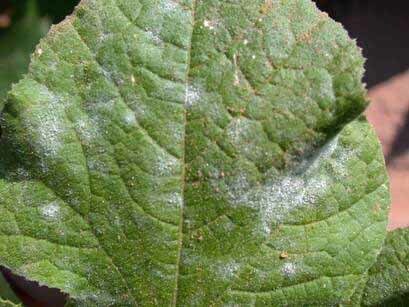 White to cream colored masses appear on the underside of leaves. Raised green blisters form that turn white during wet weather. Major symptoms is swollen, twisted and distorted inflorescences called "stagheads" that become brown, hard and dry as they mature. Yield losses of 20% have been recorded.